Healthy no bake brownies recipe | so fudgy and chocolatey! I hope you guys don’t get tired of my brownie blog posts, but seriously who gets ever tired of eating brownies?! Not me! So after sharing my recipes for these Sweet Potato Brownies and my Best Vegan Brownies, I decided to make Healthy No Bake Brownies. They aren’t fully raw, that’s why I don’t call them raw vegan brownies, but they are almost raw and you can actually make them fully raw (continue reading to learn how). I got asked a few times if I prefer no bake brownies or regular baked brownies. Well, I love both, I always thought I prefer baked brownies because you can include veggies or legumes to the brownie batter and furthermore they contain less fat (at least my recipes are low in fat). However, after eating these healthy no bake brownies I am not sure anymore because they are so fudgy, gooey and delicious. So yes I love both, and these no bake brownies are actually also relatively low in fat. Oh, and did I mention they are also vegan, gluten-free and refined sugar-free?! 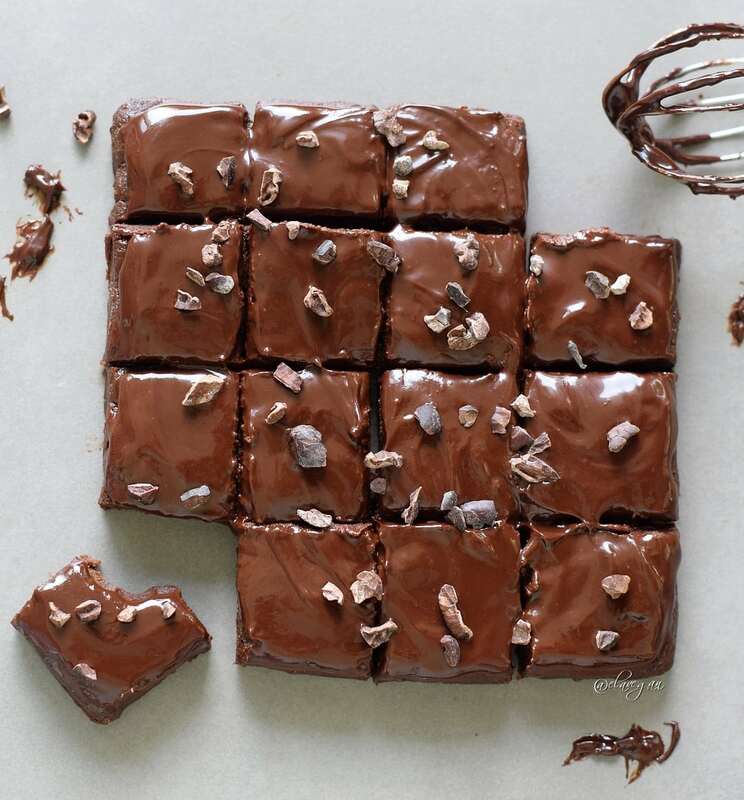 These healthy no bake brownies contain a good amount of flax seeds which are so beneficial for our health as they contain lignans: “Flax is the #1 whole-food source of lignans with 800 times more lignans than most other foods. The phytonutrient is associated with prolonged survival in cancer patients, especially breast cancer”. Also “eating a tablespoon of ground flaxseed daily may help prevent and treat diabetes.” For more interesting info, check out this page. I love it when my food is not only yummy but also healthy. So by eating these healthy no bake brownies, you are actually doing something good for your health, awesome right? My almost raw vegan brownies contain only 6 ingredients, which are dates, flax seeds, cacao (or cocoa) powder, peanut flour, vanilla and agave (or maple) syrup for the glaze. You might use almond flour (ground almonds) instead of peanut flour (powdered peanut butter), I tried it out and it turned out great as well. However, I really love how these brownies came out with peanut flour (powdered peanut butter), the taste is amazing. You can buy it in most big supermarkets in the US or order it from Amazon. Raw brownies resp. 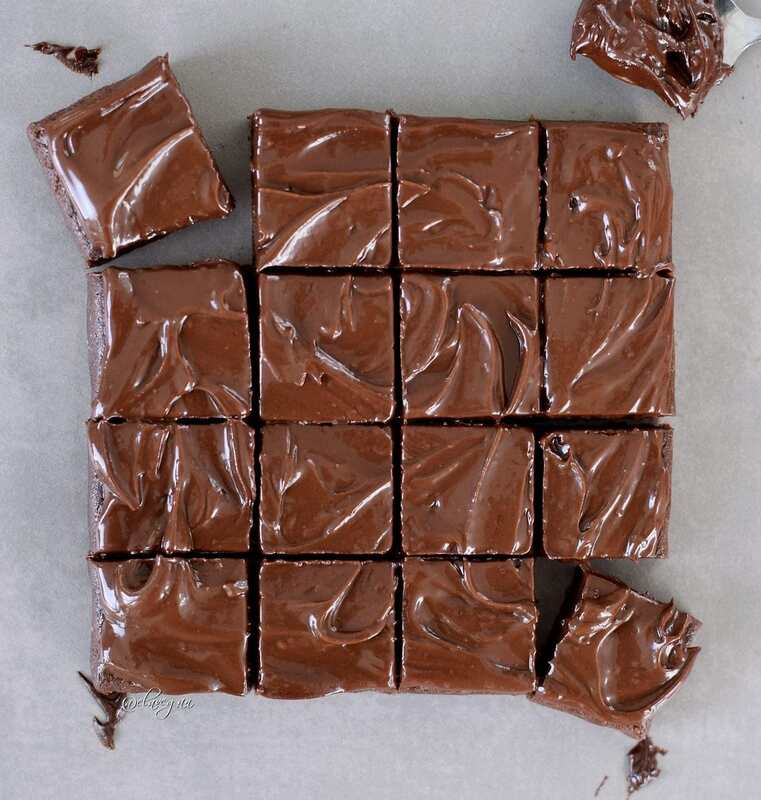 no bake brownies are typically richer than baked brownies that’s why I prefer to cut them into smaller pieces. Not only are brownie bites cuter than regular sized brownies, but they can also be neatly transported in a bento box. I noticed that eating one of these brownie bites totally satisfies my chocolate cravings as they taste more like chocolate candies. 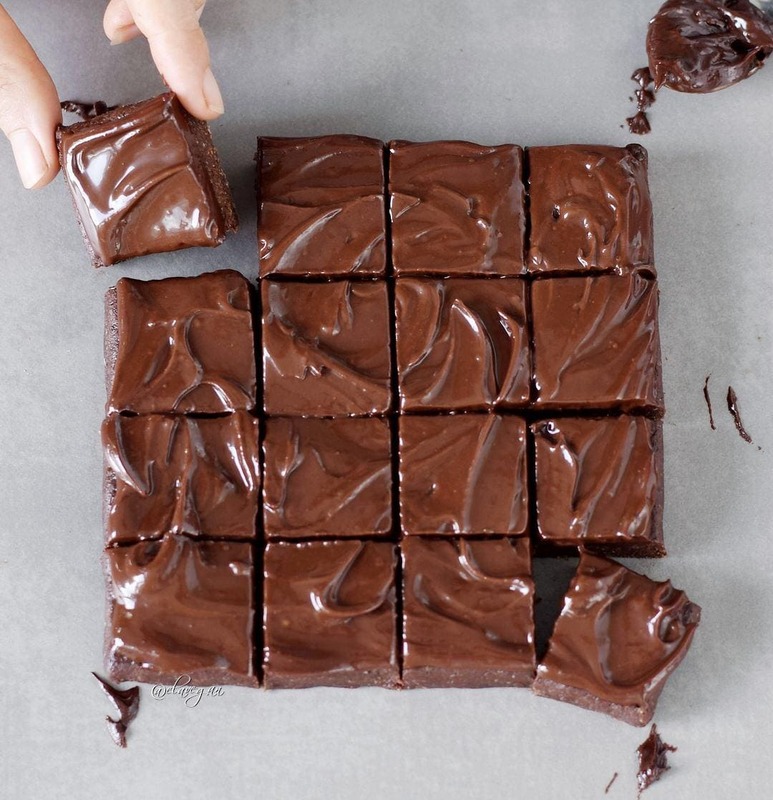 And don’t worry, you can always eat more than one little brownie. 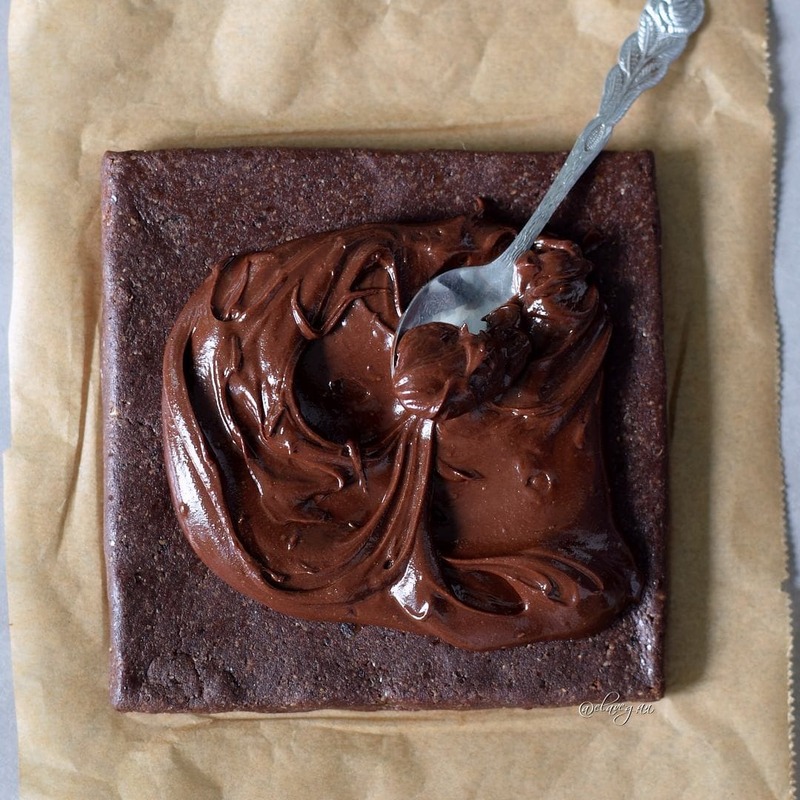 You can make these brownies raw vegan by using raw agave syrup instead of maple syrup, vanilla bean instead of vanilla extract, raw cacao powder instead of cocoa powder and almond flour (ground almonds) instead of peanut flour (powdered peanut butter). Brownies are delicious, but brownies with a chocolate glaze are even better. Especially no bake brownies need a good chocolate glaze, trust me, I am talking from experience haha. If you don’t want to make your own chocolate glaze, you can simply melt dairy free chocolate chips, but they contain of course more fat. 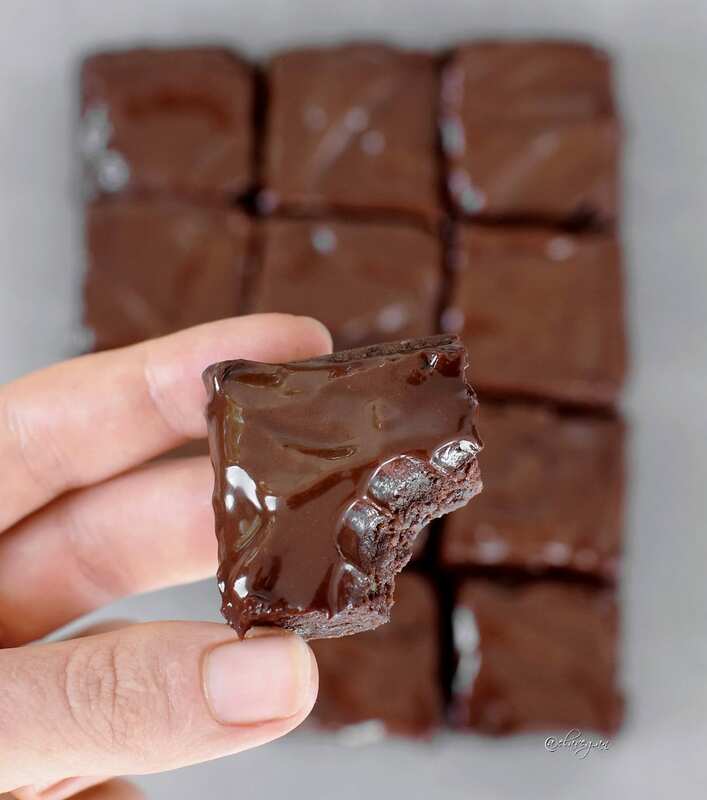 These brownie bites are so easy and fast to make and leftovers can be stored in the fridge or freezer. I cannot wait to hear if you like my healthy no bake brownies. If you try them out, please leave a comment below and tag me with @elavegan and #elavegan on Instagram and/or Facebook. If your dates aren't soft/moist enough I highly recommend soaking them in (warm) water until they are soft. You can skip the powdered peanut butter in the chocolate glaze and use 1 1/2 - 2 tbsp of regular peanut butter (or any other nut/seed butter). However, I would recommend adding more cocoa powder otherwise the glaze might be too runny. The Nutrition Facts are for one serving if you cut the batch into 16 brownie bites. Calculation includes the low-fat glaze (made with powdered peanut butter). Can’t wait to try this recipe tomorrow. My mouth is watering. I’ve been waiting for this recipe after seeing the picture sometime ago! Thank you!!! I think my little one will love these! This is life — thank you so much for this recipe … I’ve been waiting so long for them and now I am so happy!! Been looking forward to this recipe for ages!! However I have a nut/peanut allergy, would oat flour work instead of peanut flour? Hey Kahli, like mentioned in the blog post and in the recipe you can use almond flour instead of peanut flour but if you are allergic to almonds as well then oat flour should work too, never tried it out though. Maybe ground sunflower seeds would be a better option? This brownie is amazing!!! So delicious! I just saw the post and made it right away and it was so good that I DID A SECOND BATCH 10 minutes later. Thanks!!!! Best raw brownies ever! Thanks, Ela. You’re amazing and so are your recipes! ???? Aww, thank you so much, Pilar! I am thrilled that you like my raw brownies. Much love ???? Made these today – quick, not difficult at all! I used almond flour and almond butter, as per your notes on substitutions. They made a very small batch, but they’re so fudgy it’s great that they’re small. The glaze itself is fantastic, I used a hand mixer to make it extra creamy. It’s not overly-sweet, but perfect healthy bites. Thank you for this quick fudgy bite! Can you use normal flour? These look good! Could you use coconut flour instead peanut flour? Do you have all the nutritional information that would be supplied on a label if these were sold in supermarkets? Yes, I calculated everything with Cronometer and modified the post. You can check it out now. Is one serving size just 1/12 of the whole pan? Great! I like those numbers 🙂 So excited to try this, thank you for all of your hard work to provide us with such delicious recipes!! Thanks a lot for your support, Riley ???? Thank you for inventing this recipe! 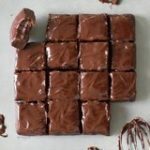 I fell in love with these brownie bites the very moment I saw them on your Instagram. I’m so glad I made them today. I chose almond flour because that’s what I had at home. The taste is to die for and they look so mouthwatering! Every chocolate lover should try this recipe! I made these brownies thinking it was going to go bad since I don’t own a food processor. Luckily, I had flaxmill to substitute flax seeds. Ok but seriously…. THESE ARE THE BEST VEGAN BROWNIES IVE EVER HAD/MADE. Even non-vegan people will fall in love with these! They have such a perfect consistency and sweetness. Definitely making these again!! These look amazing, can’t wait to make them! I want to make them to bring on an RV trip…how long will they last in the fridge or freezer? Made these last night. The brownie part turned out amazing, but since I ran out of almond flour, I used coconut flour in the topping. Believe me, coconut flour doesn’t belong anywhere near this recipe. In fact, I’m avoiding coconut flour altogether from now on due to it’s penchant for soaking up too much liquid and always creating a very grainy, unpleasant texture. I’m going to try fixing the topping with avacado. I’d add coconut oil too if I hadn’t run out of that lately. Omg Ela, these brownies are amazing! And the photography is beautiful. That ganache on top is just amazingly beautiful. I made the brownie last week and it was amazing! Auch ich habe das Rezept ausprobiert und die Brownies sind wirklich sehr, sehr gut. Vielen Dank an dich fürs Teilen. Bei mir hatten die brownies einen leichten Bananengeschmack, das hat meine ganze Familie gesagt, obwohl ja gar keine Banane enthalten ist. Uns hat es nicht gestört, da wir alle Banane mögen. Aber mich inteeessiert, ob das bei dir auch so war? I made those brownies on friday and they are delicious. I made double portion. My god this is so sweet and goes great with icecream ???? Made the brownies and they were amazing! Thanks for recipe, my dear ???? These brownies look so super delicious Ela! Thank you, Bianca! You should give them a go, they are so yummy. 🙂 Have a great day. Being vegan—and recently GF—has really put a damper on my sweet tooth. These brownies are a deliciously decadent godsend. Thank you! Those brownies are so yummy! And they’re so fast and easy to make, I love it! The pure glaze is also very good but togehther with the ‘dough’ it’s just perfect ????. But my electric blender hadn’t made it so smooth and ‘sticky’, have you any tips? I used a blender, but with the extra date or a drop of coconutoil it worked out very well. Thank you. This recipe is amazing! Thank you Ela! 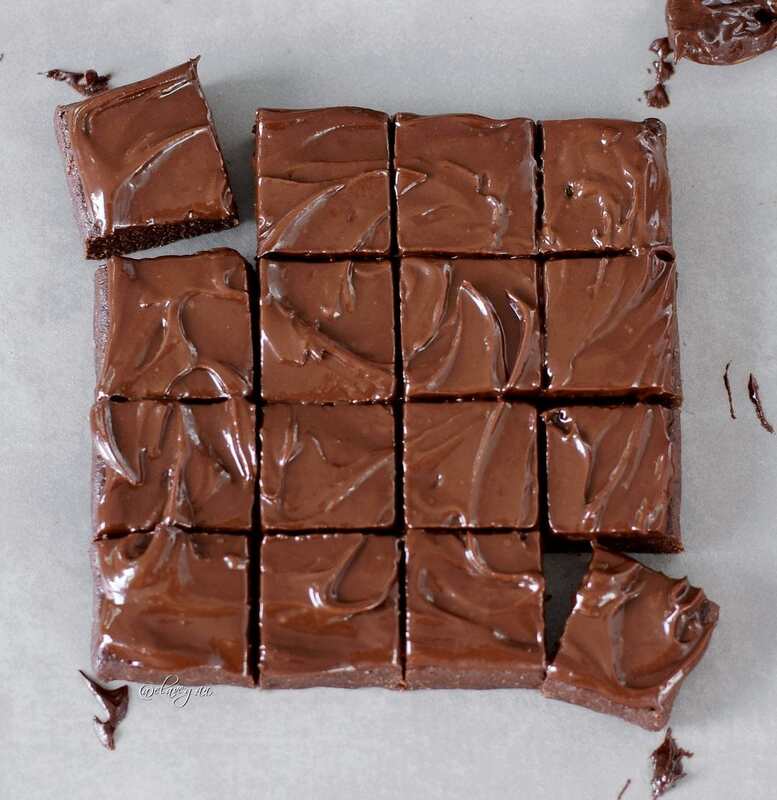 These brownies are super delicious- So simple and quick! I keep them in the freezer, so I always have them prepared as a snack. Hi Ela..The brownie look amazing!! My mouth watering just by looking at your photo. Planning on making it soon. Btw for the glaze, can i use raw honey instead of maple syrup? I wish I had these in front of me right now! Looks so tasty- going to try these very soon! 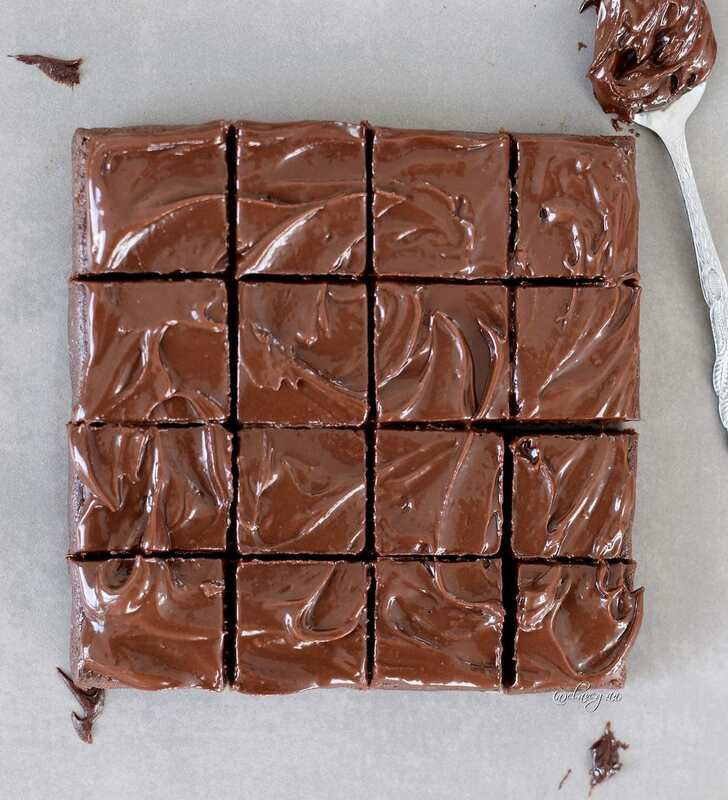 These brownies are epicly amazing. I can’t get enough. I used crunchy peanuts butter in the glaze for a bit of crunch. I’m loving them!! Hi! Looks terrific! 🙂 I’m confused with the recipe though and not sure of the flax ingredient. The recipe says whole flax seeds but the link to Amazon product shows ground flax seeds , (flax seed meal? ), and I’m not sure which one to use. Looks so delicious, just bought pb flour and can’t wait to try it! You can also use ground flax seeds (flax meal) however it’s always best to buy whole flax seeds and grind them into flax meal because this way you get FRESH flax meal which isn’t rancid (flax meal goes rancid pretty fast). Hope this clarifies your question. 🙂 Let me know how the brownies turned out. They look so fudgy and delicious Ela! Such a great recipe! Thank you foe aharing your beautiful website and wonderful recipes with ua! Keep up the fantastic work! I made these and they’re delicious! They will definitely satisfy any chocolate craving! Loved making these raw brownies… The recipe was simple and it took maybe 20 minutes to make before I popped them in the freezer for an hour. Definitely going to make again…. It will be perfect to make for thanksgiving or xmas as a nice after-dinner treat! My family love these! I made up a double batch to go into school lunches, as well as my own snacks this past week, and they went over so we’ll! My daughter has a big sweet tooth, and these definitely were a great touch in her lunches. My sons love them as after school treats. Thanks so much for recipe! We will be making them again and again! When I saw this recipe I was so excited to try it out! These are quick, easy, and I love how I already had all the ingredients at home. These are so rich and deliscious!! Will be making these very often, I love how healthy they are too! 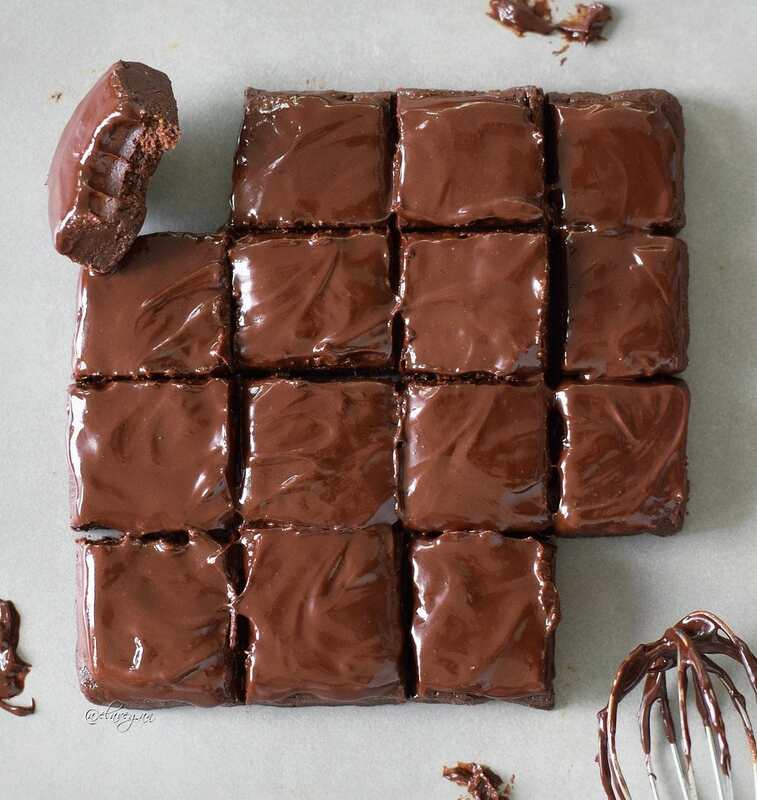 This is certainly THE best recipe for brownie bites out there! I made these with coconut flour, because my husband dislikes peanut butter combined with chocolate, and they are still more than amazing! This will be a staple at our house for sure. Thanks Ela! I recently became vegan, so I’ve been trying out new recipes. I was so surprised how the recipe goes in the food processor from a flour to a dough! I love the taste and texture, for the frosting I used almond butter and tasted amazing. Thank you so much Ela! Thanks for posting, Ela. I tried this recipe for the first time this evening. These were very tasty, especially the glaze. My hubby and I enjoyed them! I substituted oat flour for nut flour in the dough. I also used a mini chopper rather than a food processor. The mix never really went from powder to dough (even with an extra date), but I added a tbsp or two of water and molded it into a dough. I’m not sure whether the water changed the taste. Maybe I’ll have to try a hand mixer or blender next time. Hello Judy. You shouldn’t have added water, it definitely changes the taste. Have your dates been soft and gooey or dry? Mine were very soft and gooey. If they are too dry, you can soak them in warm water for a few hours. I have made the recipe multiple times and the brownies always came out super gooey, moist and delicious and I use the cheapest food processor which is available on Amazon. I always make sure to blend long enough. The longer you blend the more will the dough stick together. Hope you will try them again soon and that my tips are helpful. The best vegan brownies I’ve ever made!! Thank you so much Ela for the recipe, they are delicious! My whole family loved them too (who don’t usually enjoy my healthy deserts)! They combine really well together so they arent crumbly, rather they are so soft and ‘creamy’ like. Adding green peas is such a great way to get vegetables into the diet especially for kids as you can’t taste them! Thanks again Ela ???????? These brownies were so delicious and easy to make!!!!! I used almond flour instead of peanut flour as I had some leftover but they still tasted amazing! ???????????? Thank you very much for your feedback, Melissa. Yes, I also like them with almond flour! ???? these are INCREDIBLE!!! my family LOVED them!!!! they are packed with wonderful ingredients and i swapped a few out and added a few in. Thank you so much! I stumbled across this, and made it right away!!! I will be checking more of your recipes out!! This is decadent! I made this Brownies tonight. They are literally AMAZING???? Everybody in my family loved them and in couple of minutes they were all gone. Can wait to try more your recipes Ela! You are a Star ???????????? Aww, thank you!! I am so glad to hear that you loved my brownie recipe, Cinzia ???? Hello! Would you be able to use stevia in place of maple syrup and dates by chance? Hi Melissa, I am afraid this is not possible since dates are basically the main ingredient of these no-bake brownies. I just made this for my husband’s birthday cake! I think it seems special enough. I tasted the topping and I think he will enjoy it! I used some almond butter instead of peanut flour. It was really delicious ???? So much better than any raw cake I have ever tasted. This was the first gluten free, vegan anything I’ve ever made. I’m trying to eat a little healthier and I have a big sweet tooth. I must admit I was sceptical, but these brownies are seriously delicious! Damn! Thanks for the wonderful recipe, as always! What would u feel about the date syrup as a replacement for agave/maple? When measuring the flax seeds, do i use the measurements before being ground or after? I ground up the amount in the recipe but after it was different measurements and not sure which to use. Look Delicious you have a Thai Language? I used extremely ripe and sweet dates, it turned out a bit too sweet. I think it’s sweet enough without the glaze on top. What’s a good substitute to flax meal you recommend ? It tasted a bit bitter, I don’t like the taste of it in desserts. Thanks for sharing, I’m new to your website and so far I like it. Thanks for your feedback, George. Instead of flax meal you can use any ground nuts/seeds of choice. This tastes so much better the next day! Not too sweet anymore and not bitter at all. Wonderful! Makes me very happy. 🙂 Thank you, George! Is ir possible to use almound flour instead of peanut flour in the glaze? Hi Annie, not that’s not possible because it’s not as fine as peanut flour/powder and won’t dissolve in water. The peanut flour which I use is a very fine powder which will turn into peanut butter when you mix it with water and syrup. It’s also called powdered peanut butter. If you can’t buy it then simply follow the instructions in the recipe notes. Thanks! The brownies look great. Can´t wait to try the recipe! I just made these on a rainy Sunday and they were absolutely delicious!! Great recipe and easy to make — I had all of the ingredients just in my kitchen. Not sure I’d call these brownies, but they remind me of what people call energy balls, or something like that. Mine were still a touch dry, so I would add maybe some warm water?? But I felt good about eating these to satisfy my sweet tooth. Ich hab grad deine Brownies gezaubert und die sind echt sooo gut! Ich habe statt Erdnussmehl Mandelmehl und Mandelmus genommen und es hat super geklappt. Das Rezept wird bei uns jetzt öfter gemacht. Mein Mann ist such ganz begeistert. Toll, dass sich lecker und gesund nicht ausschließen müssen ???? Oh wie schön, das freut mich sehr liebe Romy! THESE ARE AMAZING!! I honestly think they’re better than “normal” brownies! And I love the hint of peanut butter. They 1000000% satisfy all my sugar and chocolate cravings. I think I’m always going to need to have some in the freezer at ALL times! I have a question, is the dough supposedly thinner than the glaze? I made this just now and I couldn’t spread the dough to cover 5″ cake mold. I had to use a smaller container even then the spread was really thin when compared to the glaze.